Saddle up and cycle between Southeast Asia’s most ancient and modern of cities – Angkor and Bangkok. From the Thai capital, you’ll head out into the verdant countryside, past fruit orchards, mountains and beaches. After crossing the border into Cambodia, the journey continues along quiet country lanes to the quaint colonial town of Battambang. Finally, the ride emerges at Siem Reap, where guests have the chance to explore the spectacular ancient temples of Angkor. Upon arrival at Bangkok Airport, meet your guide and transfer to your hotel. Freshen up from your long flight before joining your local team for a welcome dinner at a local restaurant to prepare for your upcoming cycle. After breakfast, meet your guides and check your bikes before we transfer via Pattaya to start the ride. We’ll enjoy some delicious traditional Thai dishes before we stop at Noong Nooch Botanical. Here you’ll see a wide variety of flora from all over the world as we ride through the tropical gardens. By late afternoon we’ll arrive in Rayong for dinner. After an early breakfast, we’ll head to Pak Nam Prasae. 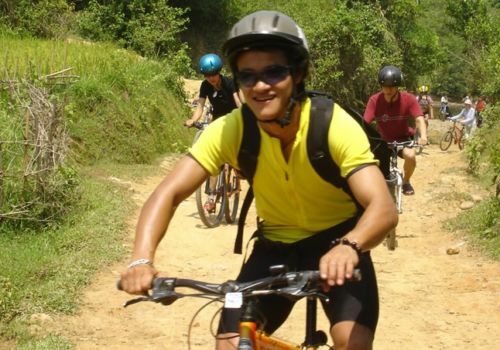 We’ll fit the bikes and cycle along the scenic road to Kung Wiman Bay. Here you can watch the fishing boats, and discover the fruit orchards and rubber plantations at the foothill of the Cardamom Mountains. The sea is fringed by casuarinas trees, forest covered hills and mangrove swamps with safe, clean beaches. As Kung Wiman beach faces west, the sun sets directly into the sea, making the beach the perfect place to relax and watch the sunset. We continue our ride, stopping for a walk along a trail with an abundance of mangrove at Kung Krabaen Bay. Back on our bikes, we’ll cycle to our beach resort at Chaolao Beach. After breakfast at the hotel, we transfer to Pongnamron and start our cycle to the Thailand/Cambodian border. We have lunch and say goodbye to our team before your onward journey to Cambodia. After arriving at the Cambodia border, you will meet with your English speaking guide and start your ride 17km to Pailin, set in the striking Chour Phnom Kravanh (Cardamom) foothills. The ride has some undulating sections – nothing too difficult – and the view of the mountains make for a very pretty ride. Pailin is now a home to exiled Khmer Rouge leaders and also famous for its ruby mines. This morning after breakfast at the hotel, we’ll saddle up and ride east to Battambang. This takes us to rural Cambodia, rich mango, orchards, corn, peanut crops and paddy fields. The ride itself has some great views as we ride along tarmac roads past the Cardamom mountains, one the wildest areas in Cambodia. We will cross streams, bridges and no doubt get the feeling of riding into unchartered territory. We’ll have lunch at Wat Phnom Sampeau and, after eating, we have a chance to visit the temple on top of a limestone outcrop. Finally we reach Battambang, Cambodia’s second city, a sleepy backwater full of faded colonial buildings and charm. 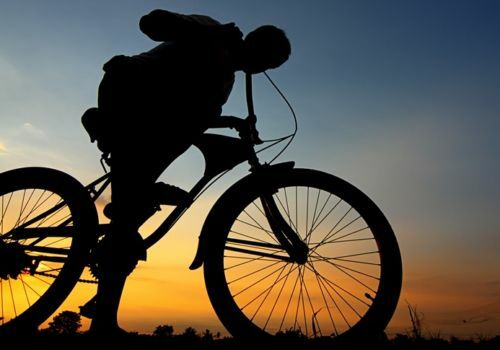 This is a tough ride on an unpaved surface with lots of potholes – but we have full van support for anyone who does not wish to ride the whole way. After breakfast at our hotel, we’ll transfer by private vehicle a couple of hours out from Battambang province to Kralang district. The team and the bikes will be ready for you to start your 40km journey through the historic highway connecting Battambang and Angkor Wat. Once you arrive in the Pouk district, you’ll have a short time to refresh before we continue on another 35km ride through the countryside. Here the jungle stretches all the way to the foot of the road; you will pass by the lotus ponds, local villages, rice fields and fish farms with mountain views in the distance. We’ll be close to the finish line at the ancient pagoda! After breakfast, we’ll meet with the guides and prepare for our journey through the jungles of Angkor. We begin with a visit to Ta Prohm temple (used as a set for one of the Tomb Raider films). It was built in the mid-12th to early 13th centuries. Ta Prohm is unique in that it has been left largely as it was found: overgrown by jungle, trees and vines, with many parts of the temple crumbling to the ground. This makes Ta Prohm one of the most picturesque and memorable of the Angkor temples. We’ll continue from Ta Prohm to the ancient city of Angkor Thom. This was the last capital of the Great Khmer Empire under the reign of Jayavarman VII. An eight-meter high wall draws a perfect square around the city. Enter through the ancient East Gate. On each side of the entrance path, a row of fifty-four gods and demons hold the sacred Naga snake of Hindu lore. From here, continue to Bayon Temple in the very centre of the city. This 12th-century masterpiece, a study in grandeur, is well-known for its fifty-four towers with enigmatic faces representing the fifty-four provinces of the Great Khmer Empire. The Terrace of the Elephants and the Terrace of the Leper King are also must-sees, both of which are known for their intricate bas-reliefs. Return later to the famous Angkor Wat. Built during the reign of King Suryavarman II in the early 12th century, Angkor Wat is constructed following the model of the temple mountain symbolizing Mount Meru, the home of the gods. Inside the temple, the walls are covered with stone carvings and bas-reliefs depicting Hindu mythology and the wars Suryavarman II fought during his reign. Angkor Wat is well known for the more than 2,000 Apsara dancers decorating the temple. Construction is thought to have taken around thirty years of intensive labour. 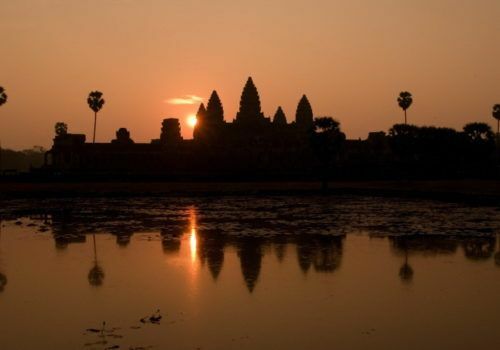 Today, Angkor Wat is figured on Cambodia’s national flag, as the temple symbolizes the soul of the Khmer people.